I am writing this on the evening of September 11, 2018. One US dollar is currently worth around Rs 72.73. This is the lowest value of the rupee ever against the dollar. On April 1, 2018, at the beginning of the financial year, one dollar was worth Rs 65.11. 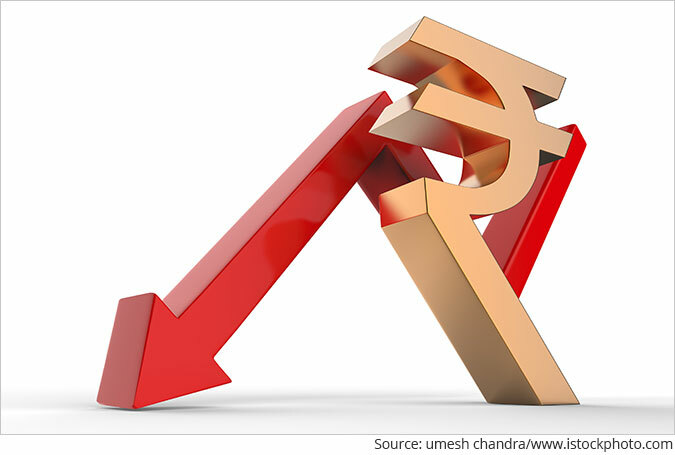 The rupee has seen a fall of 11.7% in value against the dollar, since the beginning of this financial year. The biggest repercussion for this in India is being seen on the oil front. India is massively dependent on oil imports when it comes to meet its oil consumption demand. And this dependency has been going up over the years. Between April and July 2018, India imported 83.3% of the total oil that it consumed. During the same period in 2017, India had imported 82.3% of its consumption. India imported around 76.2 MMT (million metric tonnes) of oil during the first four months of the current financial year. It had imported 71 MMT during the same period last year. Over and above this increased import dependency what has hurt is the increase in the price of oil and a fall in the value of the rupee, during this financial year. The Indian basket for crude oil has averaged at $72.94 per barrel, during this financial year. It had averaged at $49.77 per barrel during the same period last year. Of course, all this has meant that Indian oil imports cost $39.1 billion during this year, against $24.6 billion last year. Essentially, all this combined with a depreciating rupee has led to a situation where petrol and diesel prices, across the country, have reached very high levels. Take a look at Table 1. It lists the price of petrol and diesel in India, in comparison to its neighbouring South Asian countries. The prices on Table 1 are as on September 1, 2018. The prices of petrol and diesel in India have risen further, since then. As on September 11, 2018, the petrol and diesel prices in Delhi were Rs 80.96 per litre and Rs 73.06 per litre, respectively. As can be seen from Table 1, the petrol and diesel prices are the highest in India. The question is why? The taxes on both petrol and diesel are the highest in India. Narendra Modi was sworn in as prime minister in May 2014. The price of the Indian basket of crude oil averaged at $106.85 per barrel during that month. It soon started to fall and reached a low of $28.1 per barrel in January 2016. The Modi government captured a bulk of this fall by increasing the excise duty on petrol and diesel. The state governments also quietly increased the sales tax/value added tax on petrol and diesel. This explains why petrol and diesel prices in India are higher. If the rupee keeps falling in value against the dollar, and the price of oil holds, the price of petrol and diesel will go up further. The only way it can come down is if state governments and/or the central government cuts the taxes on petrol and diesel. Let's take a look at Table 2. Table 2 basically gives details of what portion of total expenditure of state governments is financed by sales tax/value added tax on petroleum products. Source: Author calculations on data from Reserve Bank of India and Petroleum Planning and Analysis Cell. It is clear from Table 2 that the proportion of expenses being financed by the state government through revenue earned by taxing petroleum products has come down over the last four years. It was 6.7% in 2014-2015. It is down to 5.7% to 2017-2018. While, quite a few state governments have cut sales tax/value added tax on petrol and diesel, and offered marginal relief to consumers in their state, state governments on the whole are not really in a position to cut taxes on petrol and diesel, without impacting their other expenditure. Let's take a look at Table 3. Table 3 basically gives details of what portion of total expenditure of the central government is financed through the excise duty it earns on petroleum products. As we can see from Table 3, the proportion of expenditure that the central government met through excise duty on petrol and diesel amounted to 6% of its total expenditure in 2014-2015. This jumped to 12.3% in 2016-2017 and was at 10.3% in 2017-2018. Clearly, if any one is in a positon to cut taxes on petrol and diesel, it is the central government. Of course, this would mean cutting down on other expenditure. Air India can't keep getting bailed out. So, can't 83 other loss making public sector enterprises. Calls need to be made whether, the government should continue owning 21 public sector banks. Alternative sources of revenue like sale of government land need to be looked at. All these demand the ability to make tough decisions and stand by it (I mean tough decisions here, not hare brained ones like demonetisation). It is just easy to continue things be as they are, using money that is coming in because of taxes on oil products. One of the issues that Narendra Modi had raised in the run-up to the 2014 Lok Sabha elections was the high price of petrol and diesel back then. Petrol and diesel prices currently are higher than they were back in May 2014, the month in which Modi won the election, even though the price of the Indian basket of crude oil is almost 30% lower. If high petrol and diesel prices were a political issue then, they are a political issue now as well. Secondly, Modi had also equated the value of the rupee against the dollar as matter of national pride. While back then both the moves looked like good political moves, the same issues have now come back to haunt Modi. The trouble with the falling value of a currency is that the government can do very little to prevent its falling. It can at best delay, what will eventually happen anyway. As far as petrol and diesel prices are concerned, the central government will start cutting the excise duty on petrol and diesel, the closer we get to the 2019 Lok Sabha elections, assuming the prices continue to remain high. As far as the rupee is concerned, there is very little that Modi can do. Having said that, the government will try to push the RBI to defend the value of the rupee. Hopefully, the RBI is able to take on this pressure simply because a central bank getting obsessed with the idea of defending its currency at all cost, is not something that India needs right now. We request your view! Post a comment on "Rupee@73 and Petrol > 80, Have Become a Political Hot Potato for Narendra Modi". Thank you for posting your view!